Some time ago there was a 40% off - event for the silhouette store and I "bought" tons of stuff - not knowing if I would ever use it (I subscribed for one year anyway). Along all those files there were some ticket shapes that I liked - but in fact I never used a ticket on a card before. 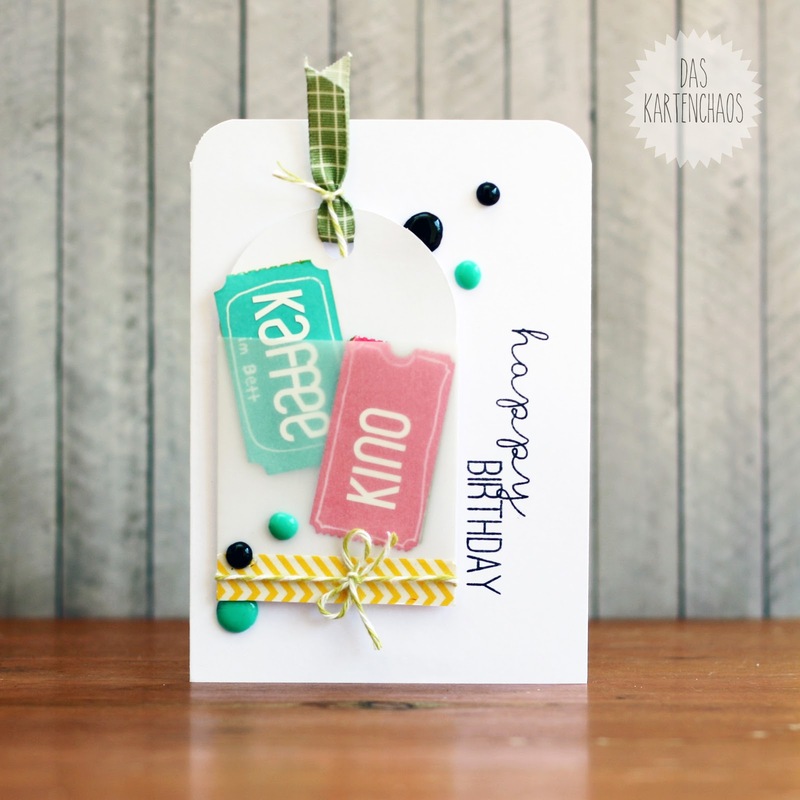 I cut out some shapes yesterday and filles the page with things that I would like to use - like the tickets. Vor einiger Zeit gab es im Silhouette Store eine 40% Rabatt Aktion und da habe ich ganz viele Dinge "gekauft" von denen ich nicht wusste, ob ich sie jemals benutzen würde (Ich habe eh ein einjähriges Abo). Unter all diesen Dateien waren auch einige Ticket-Formen die ich cool fand - aber ich habe noch nie Tickets auf Karten benutzt. Gestern habe ich einige Formen ausgeschnitten und den Rest der Seite mir Formen gefüllt, die ich gerne mal benutzen würde - wie die Tickets. In the video I explain how you can create ticket shapes easily without a plotter or a die - it's pretty easy. I am really really happy how this turned out and how the bright colors pop against the white background. Hope you like it, too! In dem Video erkläre ich, wie ihr auch ohne Plotter oder Stanzen ganz einfach eine Ticketform herstellen könnt - es ist wirklich einfach. Ich freue mich wirklich wirklich sehr, wie diese Karte an Ende aussieht und wie die knalligen Farben vor dem weißen Hintergrund strahlen. Ich hoffe, ihr mögt sie auch! What a fun birthday card! Love the tickets! Thanks for joining us at Seize the Birthday. 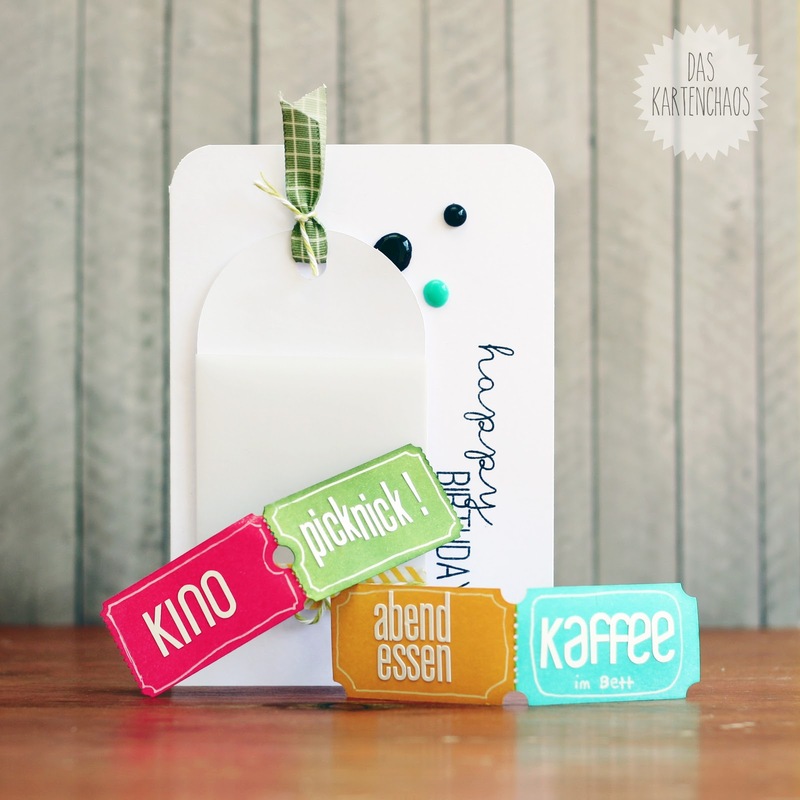 Love the idea of selfmade vouchers - and thanks for sharing how to make them without a die or other fancy stuff! Love the tickets idea - so cute and easily personalized! I think the word you said for your Silhouette-made letter stickers was 'vinyl'. It's pronounced "vine-ill" in English :) I'm so glad I stumbled upon your site recently. Your cards are so lovely and so are your videos. Keep them coming! WOAH! So genial. Und die Farben.... ein Knaller! Thanks for all the tips for hand making things, I don't have a silhouette but the other tips were great. Love the cat, show him on camera one day! He sounds like mine, I'm starving feed me, or sit down I want a lap to sit on! I love your card, it is a fun idea. The tickets are so cool!! Please post a video on how you made the alphabet stickers with the Silhouette! I have the machine, but I never use it. The stickers would be awesome! 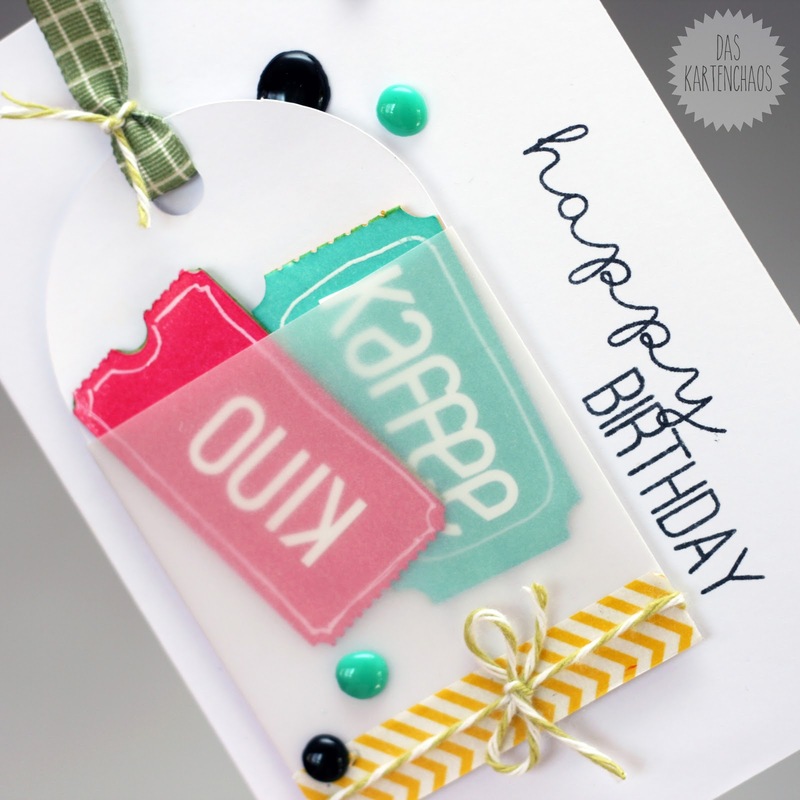 Very cute card...love how the tag has a vellum pocket. Ein Meisterwerk! Danke für das super coole Video..